The other day my friend Megan of Bowtiful Life and I took a trip to the 3 Arts Club Café in the Gold Coast neighborhood. We wanted to check it out — despite the freezing cold weather. The cafe is set right in the middle of Restoration Hardware. Which if you’re unfamiliar with Restoration Hardware, it is a luxury brand of home furnishings. The whole space is absolutely gorgeous. Seriously, it's the coolest spot ever. I was excited to spend some time with Megan and talk all things blogging. Being on the back end of it all I was curious to hear the perspective of someone who's been doing it for over five years. We discussed the different platforms and all that has changed recently in blogging, such as partnering with brands and the importance of content. Even though I’ve learned a lot over the past year at Windy City Blogger Collective there’s always new tricks and tips to learn. We also chatted about how much Instagram plays a role in blog traction. Megan mentioned how she believes blog posts have become less relevant. People are drawn to photos and don’t spend as much time on actual content. I agree that part is true. Not everyone has time to read everything posted. They tend to invest in a small number of blogs. This could be because our attention is being pulled in so many different directions all time, so it’s hard to make that connection with readers. Before we dove into the discussion we decided to order some coffee and lunch. 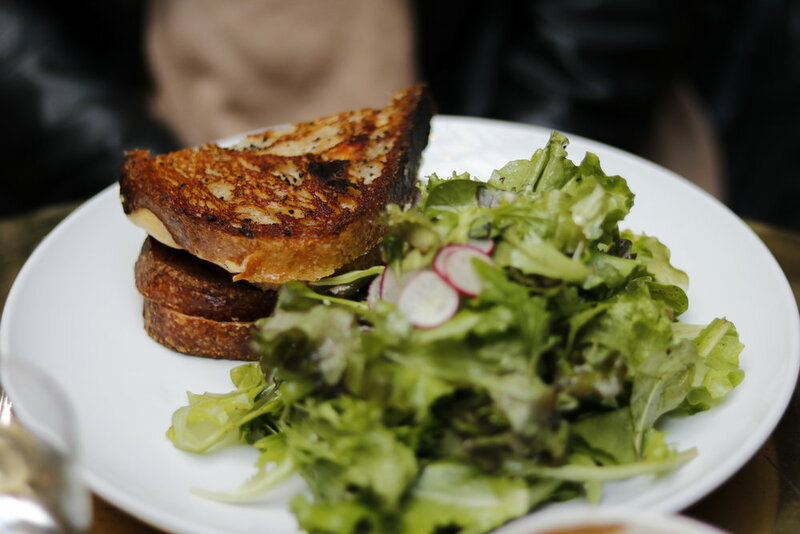 We ordered the Truffle Grilled Cheese Sandwich, which was probably the best grilled cheese I’ve ever eaten. I was curious to explore more of the space since I had never been before, so after lunch we wandered around each floor. They were all so stunning. Basically, I wish I could decorate my (non-existant) apartment with all their furniture. But in the meantime, I’ll just come back as often as possible. It was fun to chat with someone who understands the different elements of blogging. The platform is a great way to express yourself and your interests. It’s important to remember why you start a blog in the first place. Some might do it as a way to make money or if you’re like me, an outlet of self-expression.